That’s not a high bar to leap, but Mass Effect: New Earth manages it. It seems a bit weird to start with the story in a review of a thrill ride (the park rates it at a three, meaning “moderate thrill”), but it needs addressing. No, New Earth will not ease your soul if your feelings about the trilogy’s endings are tumultuous, and no, it’s not an absolutely essential exploration of canon. What it is, however, is a pretty fun ride for the uninitiated with some great shout-outs for the diehard BioWare fan. First, the story. The waiting line (which can be abysmal in Santa Clara’s inland heat) winds through a simulated spacescape with pumice-like rocks and sand. A few plaques along the path commemorate a thwarted Batarian attempt to crash an asteroid into Terra Nova, an Earth colony and vacation destination, providing some context for fans and a bit of story for those who don’t follow the series. Another advertises Mass Relay Getaways, a travel organization using retired military ships to ferry passengers to vacation on Terra Nova. Located in sunny Santa Clara, California, Mass Effect: New Earth lets you experience space travel and all its dangers first-hand. Prior to boarding, passengers are treated to a message from Mass Relay Getaways—your home away from Sol!—giving a brief summary of what you can expect on the trip. The vacation vessels feature amenities, like anti-gravity massage and Alliance-approved music, but the broadcast is interrupted by an Alliance News Network report that communication satellites in the region have gone offline. Eh, no biggie—you’re heading out on vacation, and it’s not like communication failures are rare in the galaxy, right? Step inside Great America’s 4D theater and you’re treated to a delightfully designed spaceship interior with an overly enthusiastic tour guide who turns out to be none other than the infamous Shepard fanboy and lovable nuisance Conrad Verner. Unsurprisingly, the vacation does not go as planned; along the way you’ll run into some familiar faces and sights as well as a stunningly rendered vision of Terra Nova that makes full use of the technology in all its forms. And the ride’s technology is impressive. 4D is a bit meaningless to the average person; in reality, the ride incorporates motion simulator seats that also include massage-like features to simulate rough terrain, incredible 3D visuals, a light spritz of water, and the odd—though not overwhelmingly unpleasant—choice of Smell-o-Vision. While the technology does not match up to the chaos happening onscreen, it’s impressively immersive. You may not feel like you’re actually there, but you’ll feel closer than you’ve ever felt before. Though a few fan-favorite characters make appearances in the ride, it can be tough to hear their dialog over the action sounds. One downside: the sound. The action sequences are every bit as thrilling as they ought to be, with huge booms and excellent mechanical and creature noises in glorious surround sound. Unfortunately, that drowns out the dialog—a major draw for any BioWare fan, particularly when the ride features the game’s original voice actors—as well as the surprisingly charming acting from the actor portraying Conrad Verner. 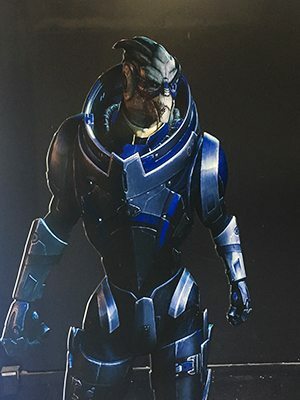 In any other ride the story and acting wouldn’t matter, but because Mass Effect: New Earth has gone through the trouble of not only having a story, but populating it with familiar characters, straining your ears to hear what they have to say over the less interesting creaking, shattering, and banging is a disappointment. And one further minor gripe: BioWare’s games come pre-made to allow you to avoid gendered pronouns when describing a franchise’s hero. Brief and quick though it was, referring to Commander Shepard as “he” when “Shepard” is right there as an alternative is an eyeroll-inducing reminder of what’s construed as being the more popular, and thus default, choice. Bummer. 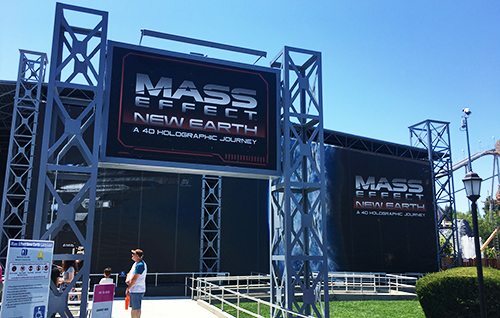 So should every BioWare fan be making a pilgrimage to Santa Clara, California to experience Mass Effect: New Earth in person? Probably not—it’s a fun ride, one well worth taking if you’re in the area, but to say it’s essential would be patently false. If you’re a fan of roller coasters, or Snoopy, in addition to Mass Effect, it might be worth it, but otherwise it’s an exciting four and a half minute ride with video game references thrown in. Not bad, but not worth a trek around the world.